As a national parliamentarian, why would you bother with EU matters? The first briefing today is from the EU Affairs Committee of the Danish Parliament. This committee has the reputation as being the toughest of the 27 national parliaments when it comes to holding national ministers to account before they head to Brussels to Council meetings, and often meet at the same time as the Ministers are meeting in Brussels. At any time Danish ministers negotiating in Brussels know they will need the approval of the EU affairs committee. The real question for me is: why do these parliamentarians actually bother? Why spend time on this? Because if you’re an ambitious member of the House of Commons then why would you aim to be on the European Scrutiny Committee? It’s technical, complicated, and it’s hard to present to any voter what you have actually done as a member of that committee. No MP (except perhaps for raving EU-phobes like Bill Cash) can ever make a career of it. Why, I wonder, is Denmark different? A small country? List-based election systems? Less everyday, direct contact between MPs and constituents? A more consensual, responsible political culture? 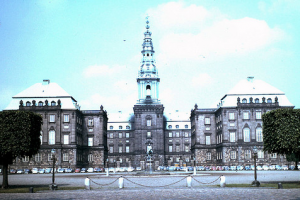 The Danish Parliament’s EU scrutiny committee was the first in Europe where the Government’s ministers have to present proposals of major significance being discussed in the council in order to obtain a nego­tiating mandate from the European Affairs Committee before a Council meeting, while matters of considerable importance must be submitted to the Committee for members’ information. The Government determines which EU issues fall within each of these two categories. The European Affairs Committee’s negotiating mandate system was laid down in the Committee’s first report of 29 March 1973. There seems a different approach to politics in Denmark as evidenced from the Killing and Borgen. Granted both are fictional in storylines but are presumably based on procedures and attitudes in their political elements both at national and city level. Clearly they have far more experience of operating proportional representation and multi-party coalitions (3,4 parties not just 2) which gives ministers far less leeway than in the UK. Might be worth asking them, but how’s about representing their constituents? I’m sure they (or their corporate/NGO/union friends) have views on Schengen, the CAP, environmental regulation (REACH, energy targets), services liberalization and institutional reform (to name a hot-button issues).